I've visited the Vin de Tahiti vineyards on Rangiroa Atoll twice now: once for Lonely Planet and the second time to take photos for an Islands magazine article. It is one of the more surreal places I have ever been. The crazy idea to start a vineyard and winery on a tropical atoll with no volcanic soil or stable fresh water source came from an extremely wealthy, wine-loving French businessman named Dominique Auroy. 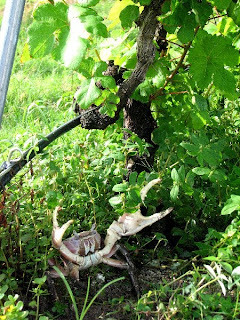 It's said that Auroy decided to create the vineyards because French Polynesia imports so many bottles of wine per year it seemed silly for the islands not to produce its own. Ironically, production has been geared almost entirely for tourism and export. 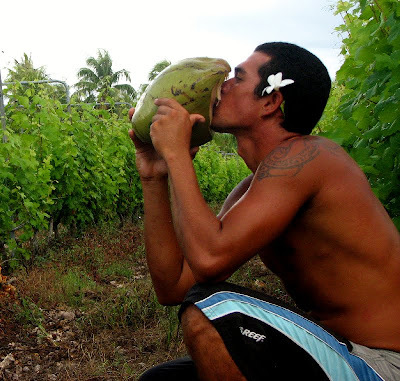 Still, visiting the vineyards is a must on Rangiroa (it's 8000 CFP - about US$100 - for a guided visiting plus tasting). All those struggling vines winding their way out of coral soil between the coconut trees is one of the country's strangest juxtapositions. It's hot, it's muggy and it's by no means organic. Vin de Tahiti's winemaker has assured me that the ground water on the vineyard's islet is perfectly sweet, but there is a testing station that the water is pumped through to check its salinity before it waters the vines (that are on a drip system). Having lived on an atoll for five years and knowing how unusual a fresh water table this immense is, I am a little skeptical of how long the fresh water will last and wonder if the vineyards are frivolously sapping the island of a very precious resource. The next issue is the vast amounts of chemical fertilizers needed to turn what is essentially sand into rich, Mediterranean quality soil. Again, a whole station is set up for adding this cocktail of substances to the water before it makes its way to the vines. I am unsure if there have been studies about what the run off does to the fragile surrounding coral reefs but common sense tells me there must be a fairly large impact. The surprise ending is the wine. Vin de Tahiti makes five types of wines: red, rose, dry white, coral white and mellow white. I am no wine expert but my father was a wine educator in California's Napa Valley and my husband's family is from Bordeaux - I have grown up with and love good wine (especially red) but I am not one to go headlong into complicated terminology and cryptic fruit and vegetable oriented remarks. Of Vin de Tahiti's wines, the sweet mellow white is by far my favorite mostly because it's syrupy sweet and is great ice cold - a real plus in the tropics. The Rose and other whites are drinkable but certainly not worth the $40 price tag - you are paying for novelty value here not taste. The red is so awful it can hardly be described as wine. I've had to write about it with phrases like "unlike any wine you've ever tasted," and "unique," but there you go, truth is I think it's terrible. But don't take my advice, on Rangiroa you can try all the wines at Vin de Tahiti's lovely, air-conditioned tasting room that requires an undisclosed amount of petrol to fuel the generator. Yes, Vin de Tahiti isn't the most eco-friendly wine in the world, but it might be the most interesting. You can find out more about them at www.vindetahiti.pf. Post-Heiva: Better Than the Real Thing?